CHARLOTTE HAS YOUR COLLEGE CLOSE TO HOME | South Charlotte Newcomers! Charlotte is a favorite destination for families looking for beautiful, safe neighborhoods, and great private and public schools. People who move to Charlotte fall in love with the area and usually STAY in Charlotte. Soon, finding great neighborhood schools evolves into finding a great college. In addition to the many Universities throughout North and South Carolina, Charlotte can accommodate your growing family needs by offering many college opportunities in, or just minutes from, the Queen City! Queens University regally rests within the Charlotte city limit at 1900 Selwyn Avenue in the historic Myers Park neighborhood. Founded in 1857 as the Charlotte Female Institute, Queens College became Queens University after its many graduate programs led to its reclassification in 2002. Today, Queens University of Charlotte has approximately 2,700 students studying liberal arts, sciences and professional studies. There is a 10:1 student-faculty ratio that boasts a welcoming Southern hospitality. Students are required to live on campus in one of eight coed residence halls until reaching senior status. 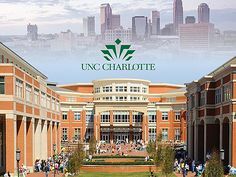 The University of North Carolina Charlotte was established as a four-year, state-supported college in 1965 and in 1992 was authorized to offer programs leading to doctoral degrees. The University currently offers 90 bachelor’s degrees, 63 master’s degrees and 21 doctoral programs. Enrollment is now over 27,000 and UNC-Charlotte is the largest public institution in the Charlotte region. The 49ers can now boast a Division I football team! Johnson and Wales University is a private, nonprofit NEASC-accredited school nestled in Uptown Charlotte. The JWU Charlotte Campus opened in fall 2004. JWU has approximately 16,000 students with over 40 undergraduate and graduate programs in culinary arts, business, arts and sciences, technology and education. The College of Culinary Arts and the School of Technology are offered as 2-year associate degrees. The Charlotte School of Law has the convenience of an Uptown location. The school offers a Juris Doctor degree (JD) and JD/MBA degrees and is partnered with the University of North Carolina Charlotte. The Charlotte School of Law was established in 2006, has 1,591 students and is fully accredited by the American Bar Association. Johnson C Smith University is a private, historically black college founded in 1867. This four-year liberal arts university has more than 1,400 students, 23 fields of study and 15 NCAA Division sports teams. Johnson C Smith University is located in North West Charlotte, near Uptown, at 100Beatties Ford Road. Kings College is a small, for-profit career college offering associate degrees and diplomas. Located in the Elizabeth neighborhood, just south of Uptown Charlotte, this accredited college is the choice for those seeking short-term, career focused programs. Wingate University, founded in 1896, is located in Wingate, North Carolina, about 50 minutes from Charlotte. Wingate University has more than 3,000 students and offers 35 undergraduate majors, 5 graduate degrees and 3 doctorate degrees. Wingate student athletes compete in 22NCAA Division II sports. Belmont Abbey College is a small, (1,700 students), Catholic Benedictine, Liberal Arts College. All students are welcome regardless of religious affiliation. Belmont Abbey is on the National Register of Historic Places and is located 10 miles west of Charlotte. Belmont Abbey offers B.S. and B.A. degrees in 13 different areas. Belmont Abbey has a beautiful, serene campus and is considered one of the top Catholic Colleges for faithfulness and affordability. Winthrop University is located in Rock Hill, S.C., 20 minutes south of Charlotte. Winthrop University was founded in 1886 and has 4,974 undergraduate students and 1,050 graduate students. This inviting college campus is in the National Register of Historic places and its Southern charm includes wooden porch swings throughout campus. Winthrop offers men’s and women’s sports, and participates in the NCAA at the Division I level as a member of the Big South Conference. Davidson College is another local historic college, just 19 miles north of Charlotte, in the town of Davidson. Founded in 1837, Davidson has 1,950 students. Davidson offers baccalaureates in 27 majors, 17 minors and Interdisciplinary Studies. Steph Curry, 2015 NBA Most Valuable Player and two-time NBA All Star is a Davidson College Alum. Central Piedmont Community College (CPCC) is located in Uptown Charlotte and is the largest community college in North Carolina. Founded in 1963, the college has six satellite campuses and more than 70,000 students. This two-year college is often a springboard for students into the university of their choice. CPCC offers over 100 degree, diploma and certificate programs. Students can earn associates degrees and certificates in 20 different fields. The Queen City is graced with superb neighborhoods, family friendly parks, great social and professional opportunities, a thriving music and art scene AND brimming with local college choices! There’s a college within driving distance for all Charlotteans seeking localized higher education!